I’m one of those cooks that likes to use every last bit of something. Well, I try to be one of those cooks. Okay, so the truth of it is more like: I really want to be one of those cooks. I have bones in my freezer from months and months ago that I fully intend to make into stock…one day. And if someone can give me a use for the liquid that I strain out of my homemade yogurt each week, I will be eternally grateful. See? I’m working on it. And a recent endeavor made me aware of one thing that I will now be saving to bring myself closer to full-blown domestic goddess status: egg yolks. I’m long past the days of cooking up egg whites only–those orange-yolked farmers’ market eggs are just too darned tasty and nutritious. I do, however, like to add about one egg white for every two whole eggs that I scramble in the morning. It helps to make them extra light and fluffy. Also, my bread dough recipe, which works as pizza dough and much more, calls for a couple egg whites (Heads up: don’t go scouring the recipe index–it’s not there. I’m saving this one.). This, of course, leaves me with a decent amount of yolks. Except, they haven’t really been left with me so much as tossed in the garbage along with the shells. And then I started working on that angel food cake. Two or three yolks are easy enough to forgive, but as I stood there separating a dozen eggs, the thought of throwing out so many perfectly good yolks made me cringe. Some of them went into the pastry cream for the Boston cream pie and the rest, after a little internet searching, were used up in a gluten-free version of this 7-yolk pasta dough. The dough comes together using the traditional well method, gradually stirring in the flour until it won’t take on any more and then kneading in a bit more until it’s firm yet workable. It rolls out thin. Crazy thin. I can see my countertops and fingers through it thin. And it cooks up into a firm pasta with a really nice, balanced flavor–rich from the yolks, but not tasting too much of this flour or that. The first time I made this pasta, I left it in sheets, stuffed it with dollops of Jennie’s homemade ricotta, and punched out dozens of pillowy little ravioli. That was a really good dinner (she said staring off nostalgically). 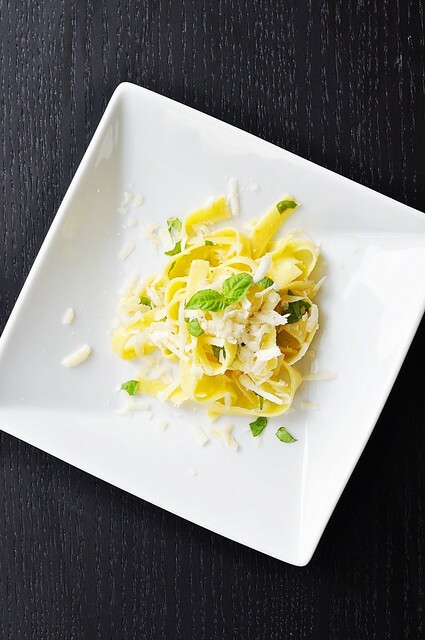 The next time, I simply hand cut it into fettuccine and tossed it with a little oil, some torn basil leaves from the garden, and a handful of coarsely grated Parmigiano. Perfection. I will say that it is a bit of work to roll out using only a rolling pin–especially if you’re making ravioli and keep re-rolling the scraps. It’s enough to make me want to purchase a pasta roller. But really only so I can get it in my mouth faster. There’s no way a little elbow grease is going to keep me from making this pasta again and again. In a broad, shallow dish, like a pie plate, whisk together the flours, xanthan gum, and salt. Make a well in the center of the flour mixture and add the remaining ingredients to the well. Use a fork to break up the eggs and mix them together with the milk and oil. 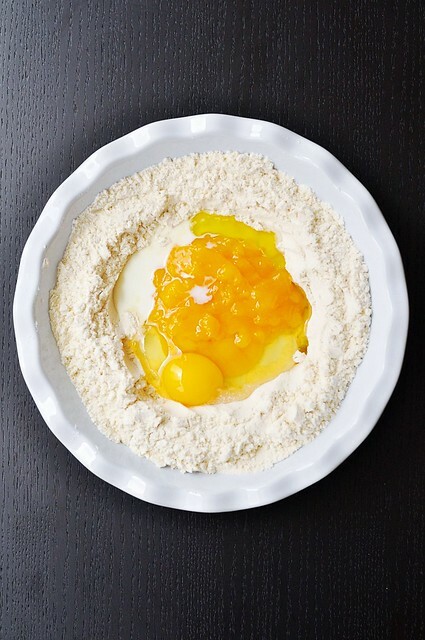 Using your fingers, in a circular motion, slowly incorporate the flour from the sides of the well into the eggs. 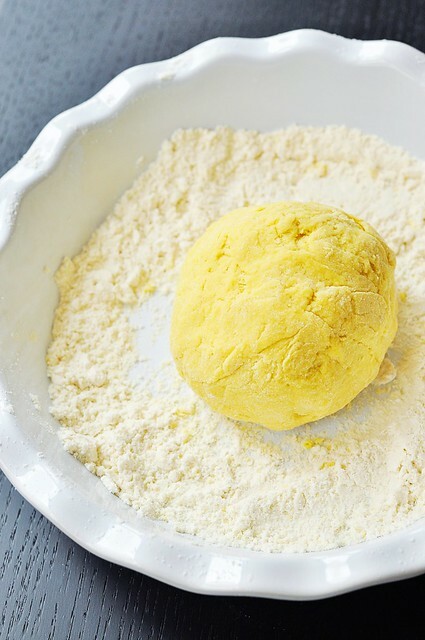 Once the dough starts to take shape, continue incorporating more flour by sprinkling it generously over the top of the dough and kneading it in. The dough will become firm and seem a little dry. At this point, use some of the excess flour in the pie plate to flour a work surface and continue kneading a bit more flour into the dough on the work surface. The dough will smooth out a little, appear a bit less dry, but will still be quite firm. Wrap it in plastic wrap and let it rest in the refrigerator for at least 15 minutes or up to 1 hour. You will have excess flour left over, roughly 1/3 cup. Pass this through a sieve and reserve it for dusting the dough/work surface when rolling out the pasta. Remove the dough from the refrigerator and cut it into quarters. Work with one piece at a time, keeping the rest wrapped in plastic. If using a pasta roller, flour the dough as needed and proceed as with regular pasta. If not using a roller, dust a work surface with the excess flour and use a rolling pin to roll the pasta very thin, continuing to flour as needed and lifting the dough off the work surface often to keep from sticking. The dough can be rolled thin enough that it will border on translucent. 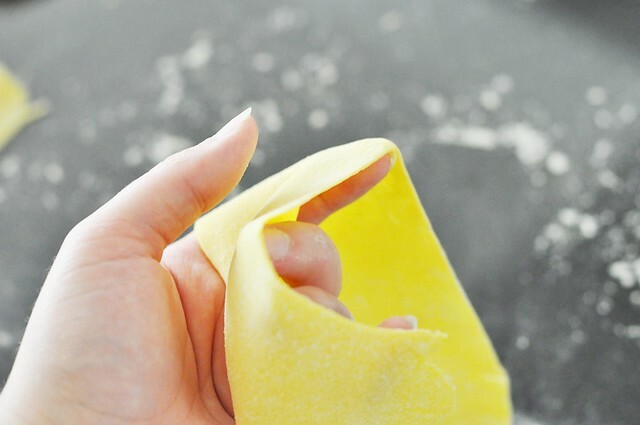 Keep in sheets for making ravioli or lasagna, or, if desired, cut into long pasta (tagliatelle, fettuccine, linguine). 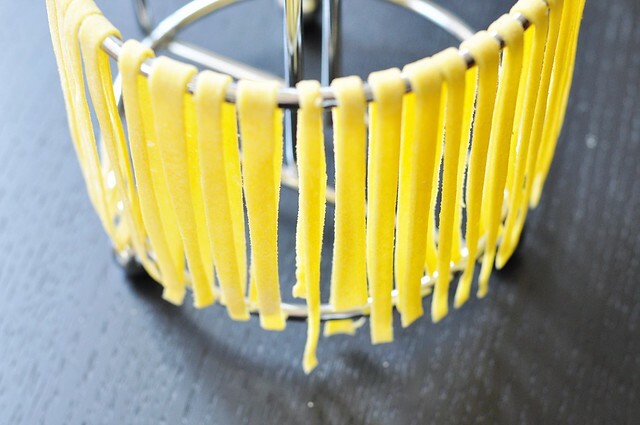 Lay long-cut pasta flat or hang so that it does not stick together; once it’s been allowed to slightly dry out for a few minutes, it will be fine if gathered and set aside or sealed in a food storage bag. If using to make a lasagna or ravioli recipe, cook as directed, otherwise cook the pasta in heavily salted boiling water for 3-5 minutes. Prepared, uncooked pasta or dough will keep for a few days in the fridge, or can alternately be frozen for a couple months. Wow, how timely that I found your blog and your pasta recipe. I got a pasta machine as my birthday gift recently from my hubby:D I can’t wait to try to make some pasta. Definitely want to try your recipe. Thanks! Totally perfect, Jas–because the 7th yolk comes from a whole egg! This is great! I always shy away from egg white only recipes because I hate wasting that golden deliciousness. It’s just not right. This is the PERFECT and most elegant way to use them! The recipe looks awesome! There are tons of uses for the liquid you drain off your yogurt (known as whey). It’s a fixture in traditionally prepared foods, especially fermented ones. The Weston A. Price cookbook “Nourishing Traditions” has literally hundreds of recipes that call for it. If you don’t waant to buy the book, try cheeseslave.com (a blog with tons of traditional recipes), there’s also nourishing days, the nourishing gourmet, & food renegade to name a few you could try. Good luck! I’ve never made pasta with just the yolks. I love how yellow it turns out! Wow. I also never dry my pasta. I just throw the freshly rolled pasta in the boiling,salty water for 2-3 minutes and then io mangio! I got a Kitchenaid pasta roller too on my birthday this September, so I am looking at recipes to try out before Christmas. There are also new findings that the Cholene in egg yolks are really good for us because they help bind old and aging ligaments together.